This tutorial depends on step-16. This is a variant of step-16 with the only change that we are using the MeshWorker framework with the pre-made LocalIntegrator helper classes instead of manually assembling the matrices. The details of this framework on how it is used in practice will be explained as part of this tutorial program. The problem we solve here is the same as the one in step-16. These, now, are the include necessary for the multilevel methods. The first one declares how to handle Dirichlet boundary conditions on each of the levels of the multigrid method. For the actual description of the degrees of freedom, we do not need any new include file because DoFHandler already has all necessary methods implemented. We will only need to distribute the DoFs for the levels further down. The rest of the include files deals with the mechanics of multigrid as a linear operator (solver or preconditioner). Finally we include the MeshWorker framework. This framework through its function loop() and integration_loop(), automates loops over cells and assembling of data into vectors, matrices, etc. It obeys constraints automatically. Since we have to build several matrices and have to be aware of several sets of constraints, this will save us a lot of headache. The MeshWorker::integration_loop() expects a class that provides functions for integration on cells and boundary and interior faces. This is done by the following class. In the constructor, we tell the loop that cell integrals should be computed (the 'true'), but integrals should not be computed on boundary and interior faces (the two 'false'). Accordingly, we only need a cell function, but none for the faces. Next the actual integrator on each cell. We solve a Poisson problem with a coefficient one in the right half plane and one tenth in the left half plane. The MeshWorker::LocalResults base class of MeshWorker::DoFInfo contains objects that can be filled in this local integrator. How many objects are created is determined inside the MeshWorker framework by the assembler class. Here, we test for instance that one matrix is required (MeshWorker::LocalResults::n_matrices()). The matrices are accessed through MeshWorker::LocalResults::matrix(), which takes the number of the matrix as its first argument. The second argument is only used for integrals over faces when there are two matrices for each test function used. Then, a second matrix with indicator 'true' would exist with the same index. MeshWorker::IntegrationInfo provides one or several FEValues objects, which below are used by LocalIntegrators::Laplace::cell_matrix() or LocalIntegrators::L2::L2(). Since we are assembling only a single PDE, there is also only one of these objects with index zero. In addition, we note that this integrator serves to compute the matrices for the multilevel preconditioner as well as the matrix and the right hand side for the global system. Since the assembler for a system requires an additional vector, MeshWorker::LocalResults::n_vectors() is returning a nonzero value. Accordingly, we fill a right hand side vector at the end of this function. Since LocalResults can deal with several BlockVector objects, but we are again in the simplest case here, we enter the information into block zero of vector zero. The following members are the essential data structures for the multigrid method. The first two represent the sparsity patterns and the matrices on individual levels of the multilevel hierarchy, very much like the objects for the global mesh above. Then we have two new matrices only needed for multigrid methods with local smoothing on adaptive meshes. They convey data between the interior part of the refined region and the refinement edge, as outlined in detail in the multigrid paper. The last object stores information about the boundary indices on each level and information about indices lying on a refinement edge between two different refinement levels. It thus serves a similar purpose as AffineConstraints, but on each level. This is achieved by passing the Triangulation::limit_level_difference_at_vertices flag to the constructor of the triangulation class. In addition to just distributing the degrees of freedom in the DoFHandler, we do the same on each level. Then, we follow the same procedure as before to set up the system on the leaf mesh. The multigrid constraints have to be initialized. They need to know about the boundary values as well, so we pass the dirichlet_boundary here as well. Now for the things that concern the multigrid data structures. First, we resize the multilevel objects to hold matrices and sparsity patterns for every level. The coarse level is zero (this is mandatory right now but may change in a future revision). Note that these functions take a complete, inclusive range here (not a starting index and size), so the finest level is n_levels-1. We first have to resize the container holding the SparseMatrix classes, since they have to release their SparsityPattern before the can be destroyed upon resizing. Now, we have to provide a matrix on each level. To this end, we first use the MGTools::make_sparsity_pattern function to generate a preliminary compressed sparsity pattern on each level (see the Sparsity patterns module for more information on this topic) and then copy it over to the one we really want. The next step is to initialize both kinds of level matrices with these sparsity patterns. It may be worth pointing out that the interface matrices only have entries for degrees of freedom that sit at or next to the interface between coarser and finer levels of the mesh. They are therefore even sparser than the matrices on the individual levels of our multigrid hierarchy. If we were more concerned about memory usage (and possibly the speed with which we can multiply with these matrices), we should use separate and different sparsity patterns for these two kinds of matrices. the local integrator, which implements the actual forms. After the loop has combined all of these into a matrix and a right hand side, there is one thing left to do: the assemblers leave matrix rows and columns of constrained degrees of freedom untouched. Therefore, we put a one on the diagonal to make the whole system well posed. The value one, or any fixed value has the advantage, that its effect on the spectrum of the matrix is easily understood. Since the corresponding eigenvectors form an invariant subspace, the value chosen does not affect the convergence of Krylov space solvers. The next function is the one that builds the linear operators (matrices) that define the multigrid method on each level of the mesh. The integration core is the same as above, but the loop below will go over all existing cells instead of just the active ones, and the results must be entered into the correct level matrices. Fortunately, MeshWorker hides most of that from us, and thus the difference between this function and the previous lies only in the setup of the assembler and the different iterators in the loop. Also, fixing up the matrices in the end is a little more complicated. This is the other function that is significantly different in support of the multigrid solver (or, in fact, the preconditioner for which we use the multigrid method). Let us start out by setting up two of the components of multilevel methods: transfer operators between levels, and a solver on the coarsest level. In finite element methods, the transfer operators are derived from the finite element function spaces involved and can often be computed in a generic way independent of the problem under consideration. In that case, we can use the MGTransferPrebuilt class that, given the constraints of the final linear system and the MGConstrainedDoFs object that knows about the boundary conditions on the each level and the degrees of freedom on interfaces between different refinement level can build the matrices for those transfer operations from a DoFHandler object with level degrees of freedom. The second part of the following lines deals with the coarse grid solver. Since our coarse grid is very coarse indeed, we decide for a direct solver (a Householder decomposition of the coarsest level matrix), even if its implementation is not particularly sophisticated. If our coarse mesh had many more cells than the five we have here, something better suited would obviously be necessary here. The next component of a multilevel solver or preconditioner is that we need a smoother on each level. A common choice for this is to use the application of a relaxation method (such as the SOR, Jacobi or Richardson method) or a small number of iterations of a solver method (such as CG or GMRES). The mg::SmootherRelaxation and MGSmootherPrecondition classes provide support for these two kinds of smoothers. Here, we opt for the application of a single SOR iteration. To this end, we define an appropriate alias and then setup a smoother object. 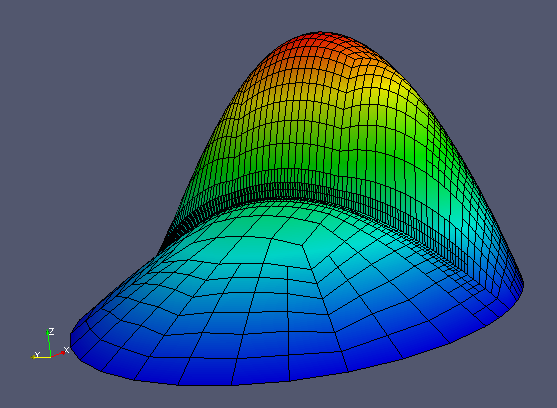 The last step is to initialize the smoother object with our level matrices and to set some smoothing parameters. The initialize() function can optionally take additional arguments that will be passed to the smoother object on each level. In the current case for the SOR smoother, this could, for example, include a relaxation parameter. However, we here leave these at their default values. The call to set_steps() indicates that we will use two pre- and two post-smoothing steps on each level; to use a variable number of smoother steps on different levels, more options can be set in the constructor call to the mg_smoother object. Now, we are ready to set up the V-cycle operator and the multilevel preconditioner. The following two functions postprocess a solution once it is computed. In particular, the first one refines the mesh at the beginning of each cycle while the second one outputs results at the end of each such cycle. The functions are almost unchanged from those in step-6, with the exception of one minor difference: we generate output in VTK format, to use the more modern visualization programs available today compared to those that were available when step-6 was written. Like several of the functions above, this is almost exactly a copy of the corresponding function in step-6. The only difference is the call to assemble_multigrid that takes care of forming the matrices on every level that we need in the multigrid method. deallog << " Number of active cells: "